Queens Park Rangers remain in the bottom three of the Barclays Premier League after twice failing to hold on to a lead in a thrilling 3-3 draw against fellow relegation strugglers Aston Villa at Villa Park on Tuesday night. Belgian striker Christian Benteke proved to be the hero for the home side as his hat-trick keeps Tim Sherwood’s side three points clear of the relegation zone with just six games to play. In-form winger gave the Hoops the lead after just seven minutes when he headed past Brad Guzan from a Bobby Zamora cross. The lead was cancelled out only three minutes later when Benteke scored his first of the night with a deflected effort that deceived R’s keeper Robert Green. 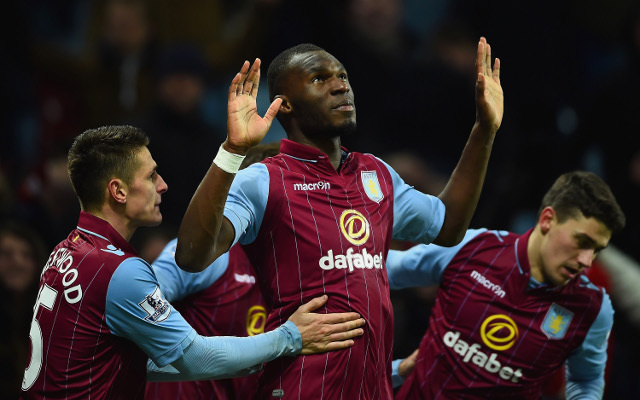 His and the Villa supporters’ mood improved as Benteke put them ahead just after the half hour mark with a cool finish. But 10 minutes into the second half Clint Hill made it 2-2 from a Phillips corner. And then Charlie Austin scored his 17th league goal of the season with just 12 minutes remaining and looked to be taking the Hoops level on points with Villa. But Benteke would have the last say as he completed his hat-trick with a brilliant free-kick to rescue a point for the hosts. Both sides are back in action at the weekend as Villa face a trip to White Hart Lane against Sherwood’s former club Tottenham and Queens Park Rangers welcome West London rivals Chelsea to Loftus Road.